The C2 Model E Indoor Rowing Machine is a commercial quality rower thats making its way into more and more homes. It is designed to improve upon the success of the best selling Concept 2 Model D. If youre thinking about buying a Model E, youve probably glanced at or are familiar with the Model D. While they share many of the same characteristics and features, there are also some differences worth noting. Just like its predecessor the Model D, the Model E uses air resistance to provide the feel of rowing on water. Air resistance is generated by the spinning of the flywheel. The faster you can get the wheel to spin with your strokes, the greater the resistance you will experience. The damper is a lever positioned on the side of the flywheel cage. The cage is marked with settings 1 through 10 so you can easily adjust the setting. The damper settings control the feel of the stroke, but you are in complete control of the resistance. No matter what setting you use, in order to increase the intensity of your workout, you will have to increase the amount of effort you put in. In other words, pull harder for more resistance. The Model E comes standard with the PM4 performance monitor, the most advanced monitor Concept2 makes. The monitor is simple to operate, provides accurate data on your rowing performance, and includes several features that will help you get the most out of your workouts. The monitor provides real time statistics on your rowing performance including speed, distance rowed, number of calories burned, and more. If youre using a heart rate monitor that interfaces with the PM4, the monitor will display your heart rate data as well. You can hop on the Model E and row without pressing a button from the start of your workout to the finish. Or you can use the menu system to choose a preset workout program, save your favorite workouts, or review your past performance. The monitor also comes preloaded with a few games you can play while rowing. The games are fun, challenging, and they break up the monotony of rowing. They also serve as teaching tools. To score high on the games, youll have to hone your technique in order to maintain a steady pace and consistent power level. You can connect the performance monitor to a PC or Mac with the included USB cable then store your data on your computer. You can also store your data online using a free utility program you can download from the Concept2 website. The PM4 incorporates wireless technology in a couple of useful ways. First, wireless racing is supported so up to 8 machines can compete against each other with no additional equipment or computers required. Secondly, wireless heart monitoring is also supported. A Garmin chest belt is included with the Model E if you want to take advantage of this feature. The PM4 comes with a battery pack that can be recharged. The battery actually recharges while you row or when the monitor is connected to a computer via USB cable. You also have the option of using two D batteries or an AC adapter to power the monitor. A LogCard for storing your workout preferences and data is included with the Model E. Data can be stored for up to five users so you only need one card even if more than one person uses your machine. The LogCard is removable so you can take your data and settings with you for use with another C2 machine. The monitor arm is sturdy and fixed in place. The viewing angle of the monitor is adjustable, however. The Model E ships in two boxes. The larger of the two boxes weighs about 70 pounds while the smaller one weighs approximately 30 pounds. In addition to the machine and PM4 monitor with rechargeable battery, you get everything you need to put it together including a complete assembly manual, the necessary hardware, and a tool to assemble the machine. You also get a manual for the rower, a manual for the monitor, a bottle of chain oil, a LogCard for storing your rowing data, and a USB cable for connecting the performance monitor to your computer. A Garmin wireless heart rate belt and a heart rate guide are included as well. The Model E is 8 feet long by 2 feet wide when assembled. Youll need an area at least 9 feet by 4 feet to accommodate the position of your elbows and the slight backward lean of your upper body as you finish your stroke. To store the machine, you can easily split the machine into 2 parts without tools using the quick release frame lock. When split, the Model E is 54 inches tall so it should fit in a closet without any issues. The caster wheels on the front of the assembled machine make it easy to wheel into position for use. Putting the Model E together is pretty straightforward. The included assembly instructions are clearly illustrated. The tool youll use is provided as well. The job can be accomplished by 1 person and shouldnt take longer than half an hour to 45 minutes. Concept2 has earned a reputation over the last 30 years for making solid, dependable rowing machines that last a lifetime. The Model E is certainly no exception. The C2 Model E is built with attention to detail and sturdy parts. The machine is rugged yet sleek and looks right at home in any health club or home gym. Both the front and rear legs on the Model E are one piece and made of welded steel. They provide a stable base and a rock solid feel. The beam is made from aluminum capped with a stainless steel track that ensures that the seat will glide smoothly. The flywheel is easy to adjust with the damper and designed to minimize noise. The chain is nickel plated and fully enclosed requiring less maintenance. The monitor arm is made of aluminum. The machine also has a double powder coat, glossy finish. The handle is 19 inches long with an ergonomic 10 degree bend. The slight angling of the handle provides a comfortable hand and arm position throughout the rowing stroke. It feels natural and very similar to rowing on water. The molded rubber footrests are comfortable, simple to adjust, and they can handle a wide range of shoe sizes. You can even row barefoot if you like. The seat is 12 inches wide, 10 inches deep, and 1 and a half inches thick. The seat has contours for your tailbone and pelvic bones. Seat comfort is highly subjective, though. You may find it sufficiently comfortable. Or you may want to try folding a towel over it, placing a section of bubble wrap on top of it, or buying a seat pad to make it more comfortable. The seat height on the Model E is 20 inches. That is roughly chair height and a full 6 inches higher than the Model D. The added height makes it very easy to get on and off the machine, even if you suffer from knee problems or have limited mobility. Even if you are brand new to indoor rowing, getting started with the Model E is simple. Once you have the machine assembled, you can hop on, strap your feet in, and start rowing. You will want to take some time at some point to familiarize yourself with all the great features packed into the performance monitor, though. You have the option of recording your stats, playing games while you row, using any of the preset workout programs, and monitoring your heart rate so it pays to learn how to use them. It shouldnt take much time either as the monitor is menu driven and comes with a manual that clearly explains how to use every feature. Youll also want to try rowing at different damper settings. Higher settings require more effort to get the flywheel spinning, but that doesnt necessarily result in a better workout. If your aim is to improve your stamina or drop a few pounds, you dont want to be exhausting your muscles without gaining any of the rewards that cardiovascular exercise offers. In terms of maintaining this machine, youll want to wipe down the monorail after each use. You should also clean and lubricate the chain with the chain oil provided after every 50 hours of rowing. After every 250 hours of use, you should check the flywheel for dust then vacuum if necessary, check the screws and handle cord to make sure they are tight, and examine the chain for stiff links. Like all equipment hat use air resistance, the Concept2 Model D does make some noise. If you plan on setting up this rower in a shared or common space, others may find the noise distracting. They probably wont want to be talking on the phone or trying to read nearby. The seat and the chain glide very smoothly. So the bulk of the noise comes from the flywheel in the form of a whooshing sound. If you live in an apartment with shared walls, its not likely to disturb your neighbors any more than your television does. The Concept 2 Model E includes everything you need to start enjoying and reaping the benefits of indoor rowing at home. Some accessories are available and are worth considering to enhance your comfort and your experience. Many people prefer to row with gloves. Gloves can help prevent blisters as well as help you get a better grip on the handle. Any type of padded glove, like those that cyclists and weightlifters use, can protect your hands and make gripping the handle more comfortable. A seat pad may be worth investing in as well. Youll be spending a lot of time sitting on your rower so trying to make it as comfortable as possible makes sense. A floor mat will protect your floors, help keep dust away from the rower, and deaden the noise a little bit as well. The Supermats Solid PVC Mat fits perfectly underneath the Model E and is well made. RowPro is software that works with Concept2. It adds enhanced performance tracking, has a ton of coaching advice built in, and adds a 3D graphical display to make rowing more enjoyable. The program also allows you to join with other rowers over the Internet for free group rowing sessions appropriate for your level of fitness and experience. RowPro software is available for Windows only. The Model E is backed by a US based company that has been building it for more than 30 years. There is a 5 year warranty on the frame and a 2 year warranty on the monitor and any moving parts. Concept2 will repair or replace any defective or worn components within those time frames. The warranty is transferable to the subsequent owner should you sell or give your machine while the warranty is still in effect. Support is available by phone during their normal business hours, by email, and through their online forum. 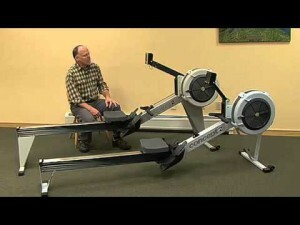 The Concept 2 Model E rower holds a 5 star rating at Amazon.com with more than 75 customer reviews submitted. Several reviewers point out the advantages of the higher seat position compared to other models including the Model D. The build quality of the machine draws many raves as does the PM4 monitor for its many features and ease of use. The top rating is clear evidence that buyers are happy with the value the machine delivers in spite of its higher than average cost. You can buy the Model E with the PM4 monitor online at Amazon for around $1,260. Because of its shipping weight, this one is not eligible for Amazon Prime. You can expect to pay about $60 for shipping to anywhere in the 48 contiguous states. The Model E tends to maintain its value very well. Its not uncommon to see used Model E rowers on marketplaces like eBay and Craigslist selling for 70 to 80 percent of the brand new price. The Concept2 Model E picks up where the Model D leaves off. Offering a higher seat position, a more robust performance monitor, and even sturdier construction, the Model E has to be in the conversation regarding the best rowing equipment for a home gym that money can buy. The Model E is appropriate for rowers of all ages and fitness levels. Its easy to assemble and store, comes with many useful features, and will last forever with minimal maintenance required.